Today at The Text of the Gospels we welcome a special guest, Elijah Hixson. 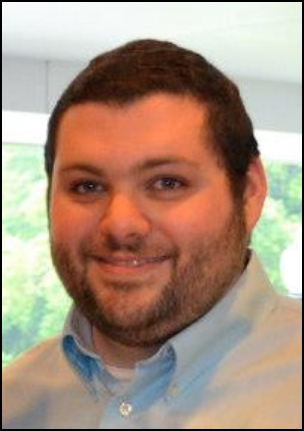 He currently is a doctoral student at the University of Edinburgh; before that, he studied at the Southern Baptist Theological Seminary, completing a thesis on the text of John in Codex Alexandrinus. He recently received the 2016 Edwin M. Yamauchi Award for Excellence in Textual Studies. His dissertation is Scribal Habits in the Sixth-century Purple Gospel Manuscripts, which we will look into shortly. He has graciously accepted an invitation to discuss his work. Hixson: Thank you very much for inviting me here. It is an honor that somebody would take interest in my dissertation. I will proceed with the caveat that I have submitted my dissertation, but I have not yet defended it. Q: Before we get to that, let’s briefly look into your thesis-paper. You concluded that the scribe of Codex Alexandrinus “was far more likely to omit than to commit any other type of error, including substitution,” and that “In general, there was not a tendency to add to the text.” When we consider this alongside similar observations made by James Royse, Dirk Jongkind, and Juan Hernández, is it safe to say that the evidence presently indicates that scribes tended to omit rather than to insert all the way into the 400s? Hixson: I am thankful for my time at SBTS and their allowing me to write a text-critical master’s thesis. However, I know that I made plenty of mistakes in that thesis, and hopefully I learned from them. I would do things differently if I had to do it again knowing what I do now. That being said, I think generally that is probably true, but not without qualifications. Q: What does this say about the canon, “Prefer the shorter reading,” and about compilations that were produced by compilers who regularly applied that canon as a decisive factor when making text-critical decisions? Should all such decisions now be revisited without that assumption in play? at the National Library of Russia. Hixson: The “prefer the shorter reading” rule sadly suffers much from oversimplification. Griesbach himself gave several exceptions in which the longer reading is preferred. Jongkind noted that a lot of the omissions that Royse pointed out fall under Griesbach’s exceptions to the “shorter reading rule”. At the same time, Royse also gave a list of exceptions when he said to prefer the longer reading, so I worry that his “prefer the longer reading” rule is also a victim of oversimplification. The weird thing is that when you factor in the exceptions given by Griesbach and Royse, the two end up being a lot closer than people might think. Both agree that the longer reading is preferred if there’s some kind of accidental or minor (likely unnoticed) omission involved. Both agree that the shorter reading is preferred if the longer reading comes from a parallel passage or could be explained as the scribe “improving” the text. I’m certainly in no place to pontificate about it, but I do wonder – given how often Royse and Griesbach are oversimplified – if it might be better to say “You know what? Let’s not worry too much about longer and shorter readings. Instead, let’s remember that scribes could omit short things accidentally, they harmonized the text, they attempted to improve the text, etc.” Let’s first be on the lookout for those kinds of changes when evaluating variants rather than simply counting how many words or letters there are and picking the shorter (or longer) reading. Q: Thanks for those thoughts. Moving on to your new work: could you briefly describe the Purple Uncials for our readers, and what is special about the three manuscripts you have been studying? Hixson: The purple uncials (or majuscules) of the New Testament are five luxurious copies of the Gospels: N (022, Codex Petropolitanus Purpureus), O (023, Codex Sinopensis), Σ (042, Codex Purpureus Rossanensis), Φ (043, Codex Beratinus) and 080, dating to the 500s. They are so-named because they are made of parchment that has been dyed purple and written in silver and gold ink. They are absolutely beautiful. Textually, they have a form of the Byzantine text. The Alands placed them in Category V (except 080, which is too fragmentary to classify). Three of them (Ν, O and Σ) were all copied from the same exemplar, presumably around the same time in the same scriptorium. To my knowledge, these three are currently the earliest extant examples of sibling-manuscripts made from a common exemplar, though the exemplar itself is lost. There are other purple biblical manuscripts as well. Do a Wikipedia search for “purple parchment” and you should see a list of a few of them. Q: Do you think you have successfully reconstructed the text of the shared exemplar of N, O, and Σ? Hixson: I only reconstructed the exemplar in Matthew, but I think I succeeded. Codex O is only extant there. I used a spiral process, in which I started with the places where all three are extant, looked for instances in which one disagreed with the other two, took that as the scribe who made an alteration, and then compared those results. I also took corrections into consideration, to shed light on what kinds of mistakes each scribe made. From that it became clear that the scribe of O was the scribe who changed the text the least, and that the scribe of Σ had a noticeable tendency to harmonize Matthew to Markan parallels. So for instance, when only Ο and Σ are extant, and they differ, it is more likely that O preserves the reading of the archetype, especially if the difference could be explained as a harmonization to Mark by the scribe of Σ.
I also rated my confidence in the reconstruction of the archetype at those points of variation with A B C and D. The ratings are entirely subjective, but at least I was honest and gave reasons for why I adopted the readings I did, and how sure I am of my decisions. Q: Is it true that the copyists of the Purple Uncials wrote in silver ink, and used gold ink for contractions of the sacred names, such as “God” and “Lord”? Which sacred names received this treatment? Hixson: It is partially true. The scribe of N did it, and I believe the scribe of Φ did it for a few chapters but abandoned the effort later in the codex. O and 080 are entirely in gold, and Σ only used gold for the titles and first three lines of each Gospel. The scribe of N used gold for “Jesus,” “God,” “Lord,” “Christ,” and sometimes for “Father,” “Son” and “Spirit.” The scribe of N also wrote the marginal chapter headings in gold. Q: Does it look like the copyists used two pens, switching inks as they went, or did they write the main text in silver first and then add the sacred names’ abbreviations in gold afterwards? Hixson: There are a few mistakes here and there that suggest that the exemplar did not use a different ink for any nomina sacra, and that the scribe of N would leave a blank space for them and come back to write them in later in gold. Whether that was after he finished a page, or a quire, or at the end of the work-day, is anybody’s guess. I don’t get the impression that the scribe used a different pen for gold. Q: Did they ever write the wrong name? What happened in Codex N at Matthew 13:51? Hixson: In Matthew 13:51, the scribe wrote κ in silver but left a space and went back to write ε and the supralinear line in gold. And yes, the scribe did write the wrong name a time or two. Matthew 11:27 is a great example of that. The reading in N is clearly a blunder on the part of the scribe and not from the archetype (so maybe N shouldn’t be cited there in the UBS/NA apparatuses!). Q: Parts of Codex Sinaiticus are scattered among four institutions. But Codex N is even more scattered. Can you tell us about that, and how it got that way? Could some of its missing pages still be out there somewhere? Hixson: We don’t know exactly how it happened, but portions of Codex N are presently in eight or nine locations that we know of. It is usually assumed that the Crusaders had something to do with its dispersal, and I would guess that’s probably right. We know that most of what’s missing in N went missing centuries ago because of the palaeography of some cursive Greek notes in the margins that indicate that the manuscript was grouped into bundles of 50 folios. I say eight or nine locations because one leaf of John was formerly in an Italian private collection – it was published and microfilmed – but it appears to have been sold around 15 years ago. We don’t know where it is currently. However, we do know that at least four folios were taken from N in the 1800’s, because of two modern systems of page numbers. There are four places where one system continues unbroken but the other one has a gap. This means that one folio in each of those four places was there when the first system was added, but was removed by the time the second system was added. Now, three of those four folios have since resurfaced, and sure enough, they each have the pagination from the first system but nothing from the second; these are the folios in Thessaloniki, Athens and New York. I suspect that if a single folio of Codex N ever surfaces (other than the one that was sold recently), it will be that fourth leaf. It will contain the text of Luke 4:26–36. There is some slight hope that bits of Codex O might also still be out there. Forty-three of its leaves are in the Bibliothèque nationale de France (BnF), but O also bears an older foliation system that suggests it had at least 50-some-odd leaves at some point in its modern history before the BnF acquired it in 1899. Only one of those missing leaves ever resurfaced, though, and to my knowledge, nobody has seen it since before 1962. It was in Ukraine when anyone last saw it. Thankfully, the BnF has an old black/white photo that was taken over 100 years ago, which they posted online when they digitized their 43 leaves of O last year. Q: There’s the deluxe Tyrian purple, and there’s the cheaper purple-ish purple. Similarly, there’s real gold, and there’s gold-like pigment. Are the purple and gold of the Purple Uncials the real deal? Hixson: There have been some scientific tests on a couple of them. The purple is not Tyrian purple, but the gold and silver are the real deal. Oxidation is a great way to see the quality of the gold and silver—gold is extremely resistant to oxidation, but silver tarnishes fairly easily. In the London leaves of N, the dye has faded away almost completely and the silver has tarnished to black, but you can still see the gold of the nomina sacra looking just as fine as ever. At first glance, it doesn’t look like one of the purple codices. Q: The Purple Uncials are sometimes dated to the late 400s or 500s. Is that correct? And, what date would you assign to their archetype? Hixson: I think the 500s is a good date for them. The palaeography seems to support it, and that’s true of two different types of handwriting in Σ (biblical majuscule for the main text, and upright pointed majuscule for other things). Other considerations lead me to suspect that they are probably mid-500s. I don’t think the archetype was much older than its copies. We do have references to earlier purple codices. 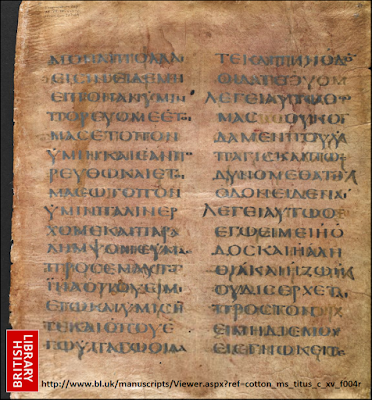 Jerome mentions purple manuscripts in a letter he wrote in 384 [Epistle 22, To Eustochium, in paragraph 32]. Q: Which one of the Purple Uncials do you think is the oldest, and does it matter? Hixson: I don’t think it matters all that much. The scribe of O was the most ideal scribe of the three. N and Σ were probably produced at the same time, and I think they are the products of a master (Σ) and his or her apprentice (N). Codex O has a lot of features that suggest that it was made – for lack of a better word – ‘differently’ than N and Σ. It’s single-column; they are double-column. It has 6-sheet quires; they have 5-sheet quires. It has illuminations accompanying the text; they do not. Whether it was made earlier, later, or while the scribes of N and Σ worked – that’s anybody’s guess. 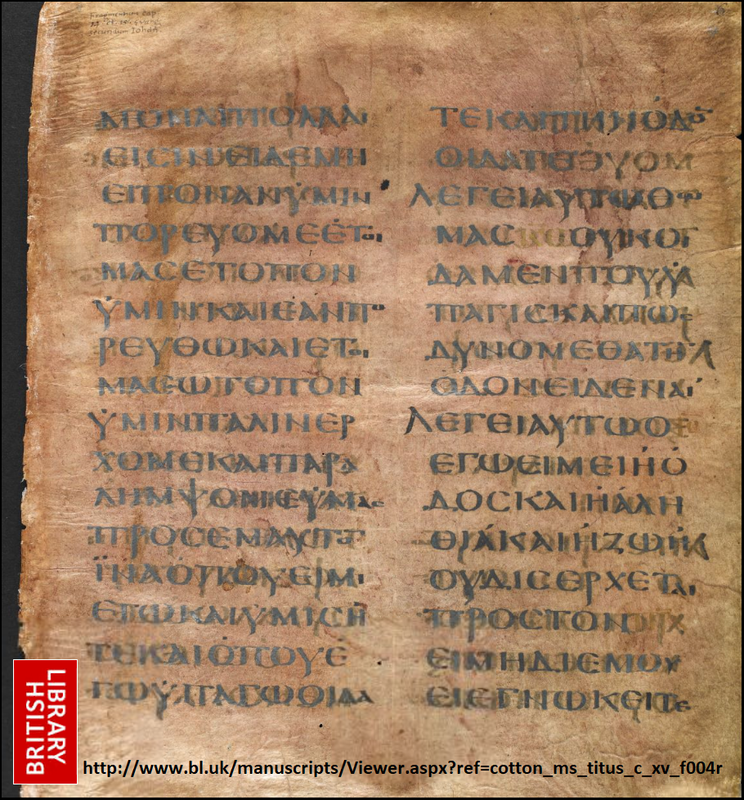 Q: Tell us about the unusual patches in Codex N. Did later owners of the manuscript use parchment from severely damaged pages to repair not-so-badly-damaged pages? Hixson: Different institutions have used different methods to repair the manuscript, but at some point, somebody used a bit of the folio containing the kephalaia [chapters] list to Luke, and bits of another folio (which originally contained part of Matthew 6) to patch other places in the manuscript. Maybe those folios were already damaged. We can hope so at least; that’s better than the thought of someone tearing up good pages intentionally! Q: Cronin [a researcher in the late 1800s/early 1900s] thought that Codex N might have omitted Matthew 12:47, based on space considerations. What do you think? Hixson: Cronin was incredibly insightful and helpful overall, but I think he was wrong there. N had Matthew 12:47. There are only two folios missing in the gap, and Σ is extant there. Σ has it (and adding it in a large section like that isn’t the sort of thing the scribe of Σ would do, nor is the scribe of N likely to omit something large like that), and furthermore, N and Σ have nearly identical line-lengths. If you count lines in Σ where N breaks off until it comes back in to folios later, you arrive at nearly the exact number of lines you would expect in N. That tells us that whatever N had on those lost pages, it occupied the same space as what Σ has in that text. I would be comfortable citing Nvid for the longer reading there. 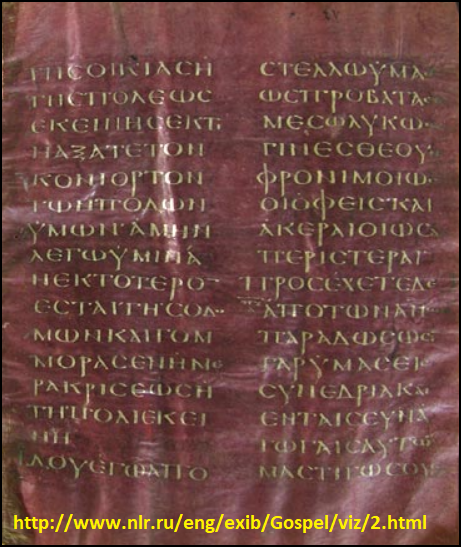 Q: Is there a possibility that any of the Purple Uncials contained the pericope adulterae after John 21, like in the family-1 manuscript-cluster? Hixson: I doubt it. In N, the very last page of John is missing, but from John 16:15 until that last page, every folio survives. The manuscript has original quire markers, and at the end of each Gospel, the scribe reduced the number of sheets he/she used per quire so as to finish at the end of a quire and start a new book on the first sheet of a new one. Kephalaia lists would have been at the end of these ‘short’ quires so that the next Gospel would still begin on the first page of a new quire – that is to say, the extra material between the Gospels was gathered with the Gospel that was ending, not with the one that was beginning. We know that the final quire of John had three sheets, and the last folio of the outer sheet is the only one missing. The text cuts off in John 21:20. I didn’t reconstruct it, but at a glance, what’s left in John 21:20-25 looks like about how much the scribe normally got on a single folio. All of that is to say that if the PA was added after John 21, it would have to have been added as a new quire on its own, after the scribe deliberately planned to end John at 21:25 and reduced the number of sheets per quire in order to do so. The codex certainly seems planned to end at John 21:25. Q: Were these manuscripts made for the Byzantine emperor and his family? Hixson: The best way I know how to put it is that they certainly smell like Justinian I. I’ve not found any contemporary historians mentioning purple codices, but they do describe Justinian’s church-building programs, and the purple codices are definitely consistent with the type of things he did. 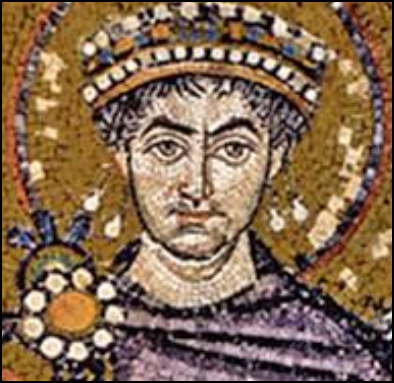 There is no proof that Justinian had anything to do with them, but I’ll go back to what I said before: they certainly do smell like him. Q: Did the exemplar of N, O, and Σ have illustrations? Also, could you take a minute to explain the “testimonials” in the illustrations, where Old Testament characters comment on events in the Gospels? Hixson: I doubt the illustrations were in the archetype. There are too many differences between the illustrations in O and Σ, and none from N survive. The testimonials are interesting. I wrote an article on that for The Journal of Theological Studies. I came to the conclusion that they were more likely copied from continuous-text manuscripts than from existing testimonia collections, and in a number of places, they seem to be showing how passages from the Old Testament are fulfilled in Jesus Christ. Q: Now that you’ve completed this project, what’s next? Hixson: I’m teaching Romans and John’s Gospel at Edinburgh Bible College this spring, so I’ll be busy preparing lectures for that. Writing-wise, I’m co-editing a book on textual criticism and apologetics with Peter Gurry, which will be published by IVP – hopefully in a year or two. I’ve got a few articles in the works that have spun out of my dissertation as well. I do have a couple of monograph-length ideas, but my ability to pursue those depends on whether or not I have gainful employment a year from now, and if so, where and for how long. At the end of the day, I am an evangelical Christian, so I want to work out my faith in Jesus Christ by careful and responsible scholarship, and I want to use whatever knowledge I gain there in some way for the Church. Thank you again for taking interest in my research! Snapp: Thank you for taking the time to discuss it! We look forward to more of your work. Here! Here! on not caring how many words/letters are added/omitted. I would also single-bracket this passage as dubious. On my browser, the links are not underlined, but in blue font. Yes; I adjusted the sentence to account for that sort of thing. Looks like I might also have to put everything in non-bold black print to keep some of the links from appearing as not-links. On the topic of gold and silver letters, by what process is solid metal converted into something that can be applied with a pen at room temperature? I have long wondered about that. Most likely ground down into a powder and mixed with something to make it basically glitter paint. I once held a Bible printed entirely with gold, I think in 1868. It weighed 12 pounds and was, of course, worth its weight in gold.